With just two ingredients and less than 15 minutes, you can make your own creamy, flavorful, homemade butter. Why make it? The flavor is unforgettable. 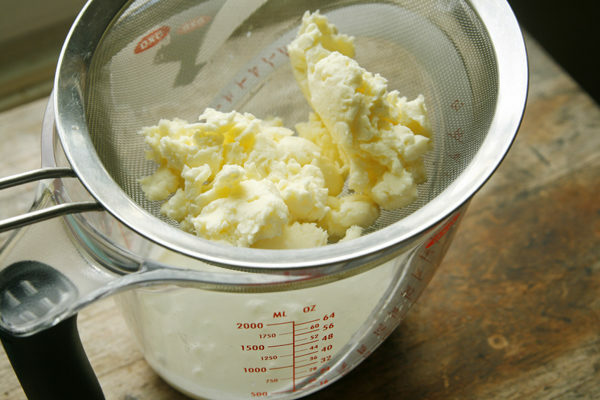 Once upon a time, butter was churned at home using cream skimmed from the top of milk. It took time waiting for the cream to rise, which took place over a few days, and effort since churning wasn’t an easy process. But it was worth it to have this creamy substance for spreading on bread, baking and more. Side note: Did you know that the making and use of butter dates back at least 10,000 years? And it hasn’t just been used for food purposes — it’s also been used for cosmetic purposes and in religious ceremonies, among other things. These days, we can go to the grocery store and choose from a wide selection of butters — both locally made and commercially made, salted, unsalted and flavored. We don’t need to make our own butter because so many companies are doing it for us. Unless, of course, you want to. And trust me, you do. 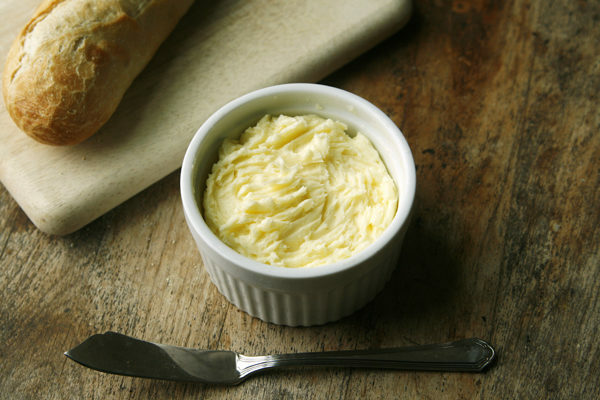 Homemade butter is so creamy, so full of flavor and so lovely on breads of all kinds. You can control the ingredients, choose the level of saltiness, season it in other ways and choose how local your ingredients are. 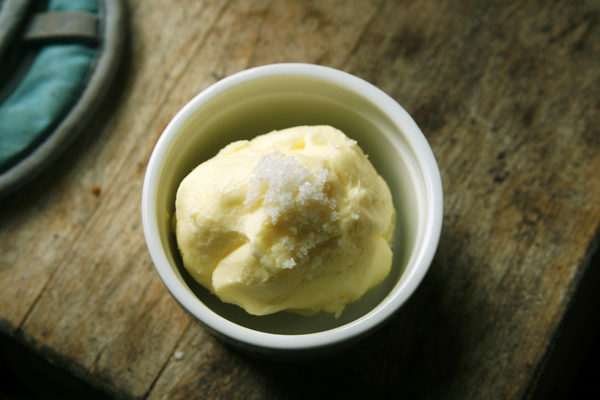 Homemade butter is something special, made with love. Did I mention that it tastes so good — silky and rich with a hint of sweetness? Because it does. It so does. 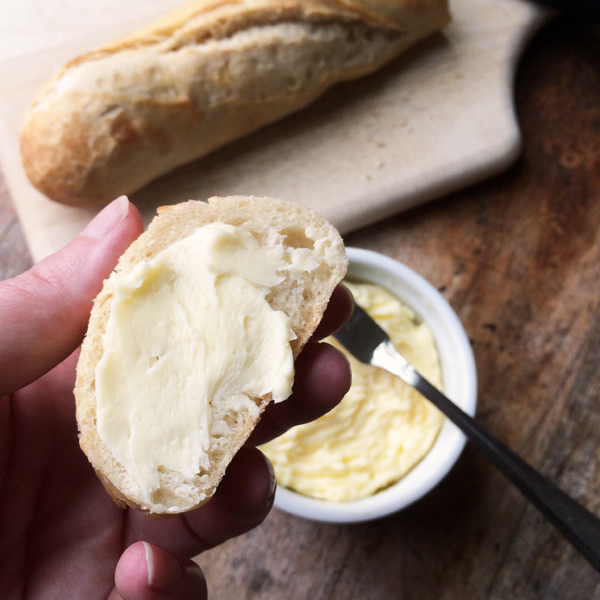 When I was in Boston recently for a client dinner at Deuxave, there was something so special — so rich and creamy — about the butter we were served with the divine broiche rolls. It was a house-made butter, salted with sea salt. It reminded me of that time I made butter in high school. Like many experiments, it began with me over-mixing whipped cream and discovering that it would change to a buttery substance. It was such a revelation back then that butter could be whipped up with such ease. 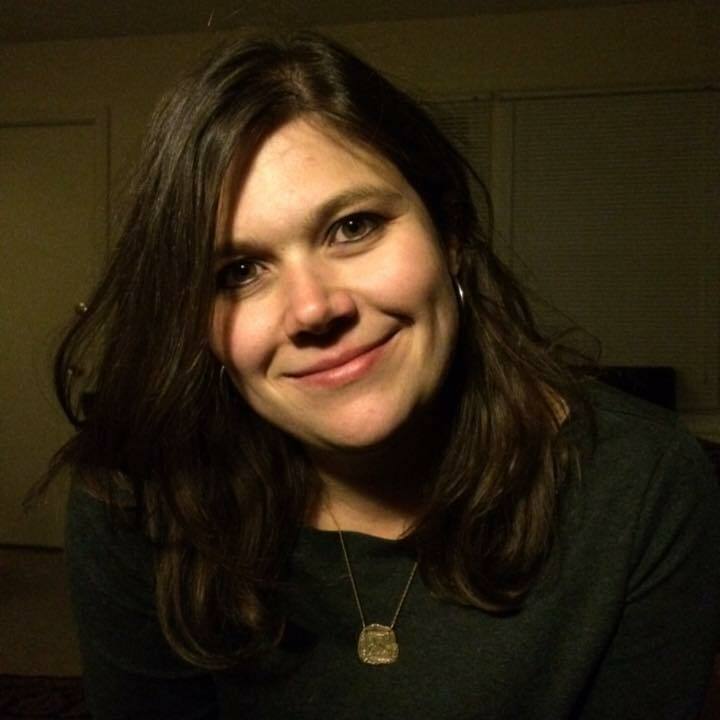 So the next time, I did it on purpose — or thought I did. I didn’t know that the soft, spreadable version I made with really almost-butter. I should have whipped it more to get to the real thing, which is a soft yellow substance that separates from the butter milk (not to be confused with cultured buttermilk used in baking). In any case, I found the prospect of making this beloved condiment at home to be a miraculous thing. 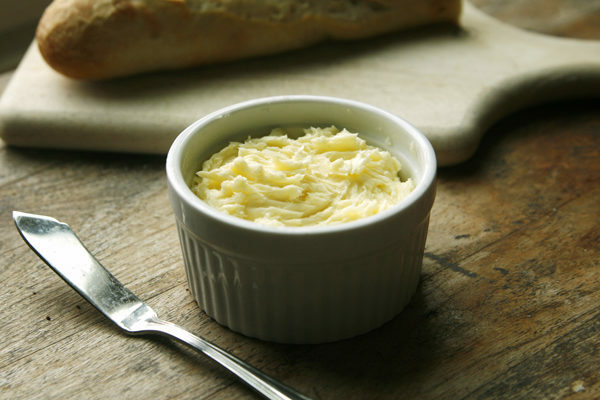 On that September night, as I sat there in the dim light of Deuxave, I wanted to make my own butter again — and this time, continue whipping it until it reached that perfect yellow color. When I make homemade butter, it’s in my stand mixer. This is my favorite method because it’s just so simple. Of course, I would be remiss not to mention how many other methods of making it exist — not just churning but also hand whipping and the jar method. Still, I choose to use the stand mixer. It’s so easy. As the title suggests, you need only two ingredients for this delicious, homemade butter: heavy cream and salt. Fit your stand mixer with the whisk attachment, and pour the heavy cream into the bowl. You’ll also want the splash guard on there — this can get a little sloshy. Then turn the mixer on high and let it whisk. The heavy cream will soon reach whipped cream status. Keep whipping it, and it will begin to look rough and lumpy. Continue mixing. When you hear the sloshing of liquid, it’s just about done. That when the solids separates from the butter milk. When it comes together on the whisk (it will take about 10-12 minutes total), it’s done. Well, done mixing at least. There’s still a little more work to do to get it right. Drain off the liquid. Well, almost. At that point, drain the liquid. That’s churn butter milk, which is a watery but milky by product. It’s not like the cultured buttermilk you can buy in the store — though could certainlyYou can save it for drinking or using in cereal, but you don’t need it for the butter. Then you’ll want to drain the ball of butter. Let it sit and drip for awhile. Finally, use your clean hands to squeeze whatever liquid you can from it. Transfer that beautiful, yellow ball to a ramekin for storage and season it as desired with salt. I use a fork to mix the salt into the butter, and it works pretty well — then you can add a pretty fork design on top too. I add about 1/2 tsp of fleur de sel for a lightly salted version, but you should totally adjust the seasonings to your tastes. Or season it a different way — with herbs, zest of citrus fruits or even some maple syrup or honey. Pour the heavy cream into the bowl of a stand mixer that's been fitted with the whisk attachment and splash guard. Beat on medium-high for 10-12 minutes until the solids and liquid separate, and the solids cling to the whisk. Drain the liquid. Then knead the butter with your hands to drain any additional liquid -- the more you can get out, the better. 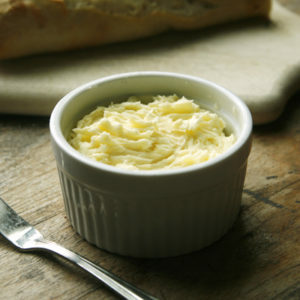 Transfer the butter to a ramekin and season as desired, mixing well with a fork. Enjoy. I remember making butter in elementary school by passing around a little jar of milk we would all take turns shaking!